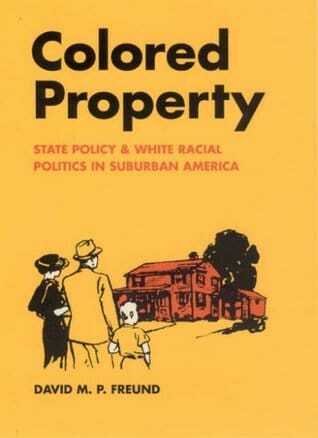 Colored Property: State Policy and White Racial Politics in Suburban America starts with a simple question about white people in Detroit within a concrete period: the time between the formation of two distinct white mobs coming together around the prospect of sharing their neighbohood with a stranger of colour – the first in 1925 (the infamous Sweet case on Garland street) and the second in 1963 on Kendal Street. So it looks at the articulation of changing ideas of race and changing patterns of property ownership and the private and public policies that shaped these. Most commentators treat white racism as something unchanging and as conceptually separable from other variables that fuel conflict between groups (including racial groups). Scholars generally portray white racism as a static, though ill-defined, sentiment, an irrational and misguided antipathy toward nonwhites. … Largely missing from this important scholarship is an investigation of how whites’ racial thinking itself changed during the years that the United States became a predominantly suburban and home-owning nation. Like many studies of the postwar metropolis, this book argues that race did matter- that whites’ racial views and preferences continued to shape struggles over housing and neighborhoods in the 1940s, 1950s, and 1960s. But unlike most studies, it argues that whites’ ideas about race were undergoing a fundamental transformation during these years. It explores an important facet of that transformation, by showing how whites grew deeply invested in new ideas about the relationship between race and property. And it argues that this new racial thinking was decisively shaped by the powerful new institutions and private practices that fueled postwar suburban growth while also successfully excluding most black people from its benefits. Rather than describe how other variables interacted with a presumably static white racism, I argue that white identity and white racism were being remade and that these changes were inextricably linked to a revolution in metropolitan political economy. The most enduring legacy of developers’ involvement was zoning’s new focus on protecting the value of residential property. Originally framed as a panacea for a wide range of practical urban problems, by the mid- l910s zoning was portrayed in NCCP sessions primarily as a tool for shoring up real estate markets, especially for “high class” residential subdivisions. Still most commentators understate the extent of federal subsidy and the depth of the federal role in shaping the private market for housing, because they focus almost exclusively on FHA and VA operations and because they do not examine how selective credit policy transformed the way that wealth in housing is generated in the modern United States. The FHA and VA worked in tandem with other powerful programs that subsidized and regulated the conventional mortgage market (for home loans not covered by FHA or VA insurance) and virtually created a secondary mortgage market (enabling investors to trade home finance debt like other securities). Taken together, this broad range of federal initiatives did more than shore up a struggling market for housing finance. It created a new kind of mortgage market and a new kind of mortgage industry, which together issued more credit, and thus produced far more wealth than their predecessors. These chapters situate federal mortgage policy within a much larger revolution in U.S. money and credit markets, demonstrating that postwar suburbanization was part and parcel of a fundamental transformation in the mechanics of American capitalism. And so, to recap in terms of how this affected people of colour in the U.S. This structural transformation was accompanied by a change in national housing politics, an ideological change of equal importance. State involvement in the private housing sector helped popularize a mythical story about the mortgage revolution and suburban racial exclusion. Supporters of federal intervention insisted that market forces alone were spurring suburban growth and that it was these same impersonal forces that required the exclusion of minorities. There follows the case studies on Detroit neighborhoods, which certainly bear out the theory above. If I have any critique of Colored Property, it’s that I think with some editing it could have lost a lot of the bulk that made it so much work to get through. It felt like a number of things were repeated or overly detailed, which might explain why it doesn’t seem to be seen as the pivotal book I really think it is in terms of connecting the formation of ideas of race with the development of property markets and the geographical consolidation of homes and wealth in the U.S.